Okay, so I could have made some sugar-filled cookies dipped in chocolate to celebrate Valentine’s Day this year, but I didn’t. This plant-strong family needed a healthier version. I was now on a mission to come up with a recipe that would make my family happy and not miss those cookies. 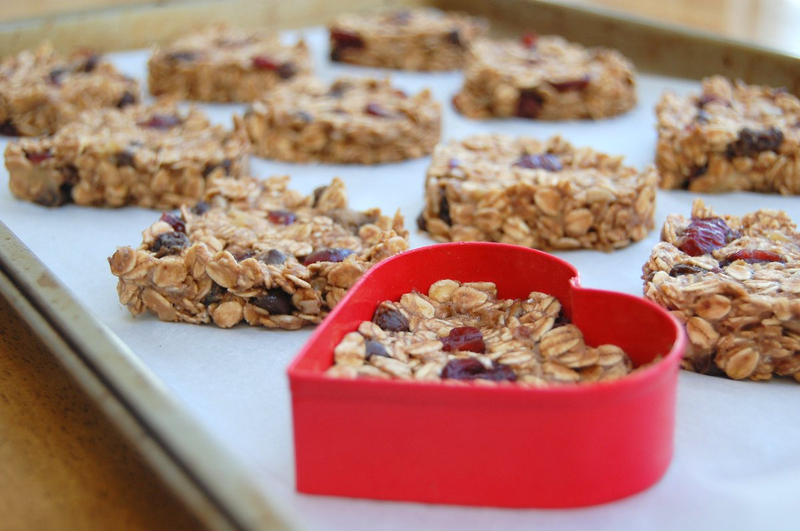 We love granola bars around here and making the home-made ones are so easy to do. If you have kids, granola bars are a great kid-friendly recipe for them to help make – it’s fun and easy. Most any combination of ingredients will be yummy and so much better than the store-bought ones. Believe me, once you make your own you will never buy store-bought again. I really loved Almond Joys growing up, so I wanted to come up with a granola bar that is reminiscent of that. OH MY GOSH, I think I did it! The whole family really loved these and I swear you will think you are eating something unhealthy (hee hee) they are so good. They also looked so cute heart-shaped which the kids really loved. Heart-shaped and heart-healthy, I’m loving this recipe. These are even better the next day and they are a very moist, cake-like granola bar. I adapted this recipe from Dr. Fuhrman’s Yummy Banana-Oat Bars. I did not put bananas in mine because I didn’t want a granola bar that tasted like bananas this time. Those are great, but I am a little anti-baking with bananas now from perfecting my Banana Bread Recipe. I sure was obsessed with that one. Try them out and let me know what you think. Cover dates in water and soak for at least 1 hour, up to 4 hours. Drain dates and combine them with almond butter, applesauce, almond milk, cinnamon, cocoa powder, almond and vanilla extract in a blender or food processor. Blend until smooth. Transfer mixture to small saucepan and heat on low for 5 minutes, stirring often. Remove from heat and allow to cool. In a medium mixing bowl mix; almonds, oats, coconut, raisins and cranberries. Fold in the almond butter mixture. Place cookie cutter on the parchment lined baking sheet and spoon batter into cookie cutter filling halfway. Press down firmly with your fingers. Gently lift the cookie cutter away from the granola and press down around inside edges to help keep its shape. 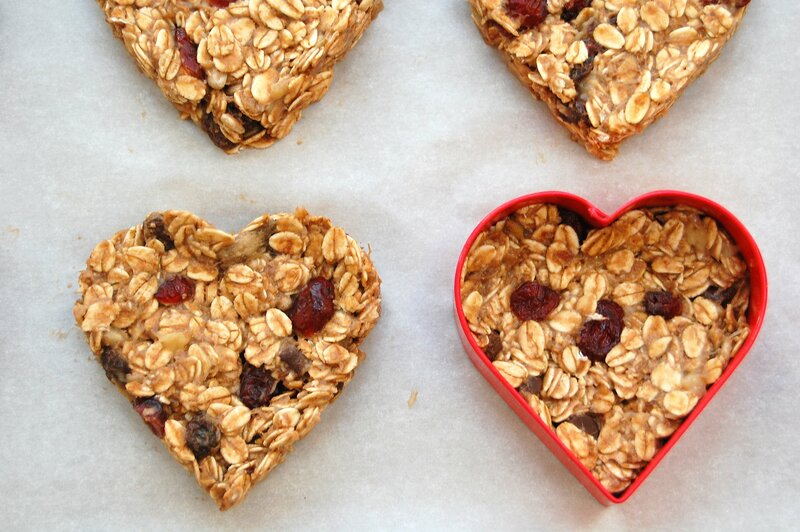 Reform granola hearts with your fingers if necessary and repeat. Bake for 30 minutes or until golden brown. Let cool completely before eating. These can be stored in an airtight container at room temperature for up to two weeks. You had me at "Almond Joy". I have all of the ingredients in my pantry . . . hmmm. Btw, I love that plate! Beautiful! I love this healthy V Day option! No doubt – I'm totally making these. Think they'd freeze well if I made a double or triple batch? I would think they would. I am making more in the next couple of days, I'll try. Let me know if that works well for you and how the recipe turns out! thanks! These are adorable! 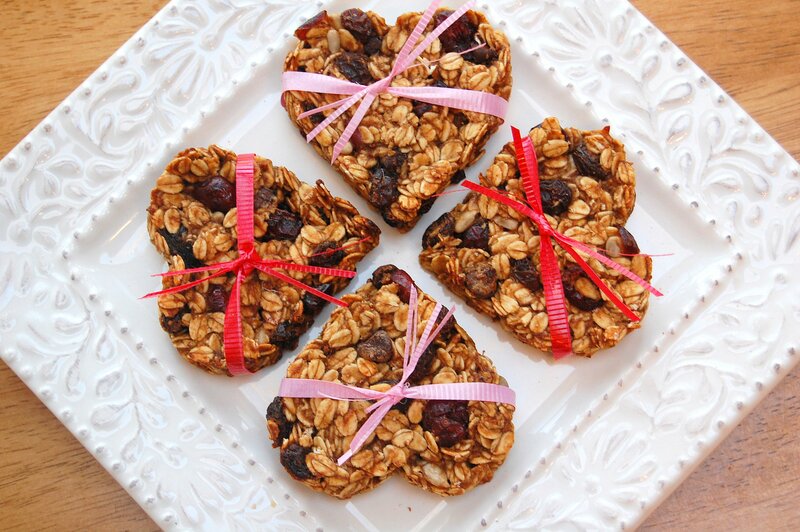 I was actually thinking of making heart shaped granola bars for Valentine's day and wondering if they would stay together. Yours look awesome, and delcious :)! I'm going to make these sans cocoa and put them in the dehydrator. This is a great idea; thanks. I am happy that they kept their shape when baked. Perhaps that is because you used the larger amount of almond milk? Thanks for the inspiration. My mom and I always say that everything tastes better heart-shaped! I totally agree. Just found your blog – my forgetful husband finally gave me the url. I'm a follower now! please let me know how they come out in the dehydrator…I'm ordering one this month! 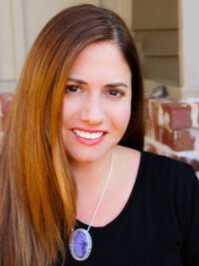 Hi Tamara! Thanks for stopping by…you should try The Green Dinosaur for Scarlet! These look great. I love granola…yummmmmm! These are great! 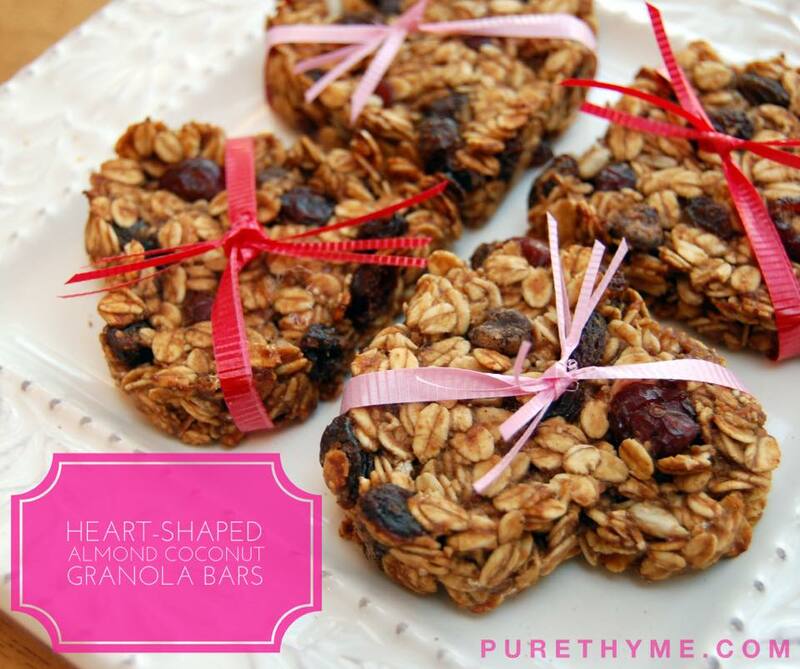 I had an old go to granola bar recipe, but these taste better AND are healthier. I was worried mine wouldn't stay together, but there were no problems. My 4 year old did a lot of the work. Definitely a keeper. Thanks! Thanks for this healthy kid option!! Just made and worked beautifully!! These are beyond adorable. I love them! 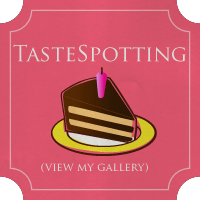 I always love coming to your blog! I have hit a milestone on my blog and wanted to Thank You for helping me get there.I really appreciated your nice comment on my blog. Thanks Again. I just found this post on Foodbuzz and I’m so glad I did!!! The idea of using a cookie cutter to shape the bars is genious. I’ve been thinking about baking my own wedding favors and I have to give this method a try. I just saw these on foodbuzz this morning! what a great wholesome granola bar! Just out of curiosity are there any substitutions for date paste? Thank you and I just checked yours out and they look absoultely beautiful and delish!! yum! I just made these to take to a kid’s valentine’s party tomorrow. They smell absolutely heavenly while baking and taste delicious once they’re cooled. Yum! Awesome! Please let me know what everyone thinks 🙂 I’ve got another version coming this weekend love how well this recipe holds it’s heart shape. Couldnt be happier with this one! My 3 yr old daughter and I made these last night and they have been a total hit. Thank you for the inspiration!